Clare Cole, 31, of Findon Road, Ifield, was banned from driving for 56 days, with a one year conditional discharge, a £15 victim surcharge, and £50 costs. She had pleaded guilty to theft from a garage in Mannings Heath, driving without a licence, possessing crack cocaine, and failing to provide a blood sample for testing. Gordon Gallagher, 41, of Clayhill Road, Leigh, was fined £250, with a £20 victim surcharge, £85 costs, and eight penalty points added to his licence. He had pleaded guilty to driving without insurance and driving without a licence, in Three Bridges. Harry Jupp, 20, of Hunston Road, Chichester, was given an 18 week jail sentence, suspended for 18 months, with £439.99 compensation, and an £80 victim surcharge. He had pleaded guilty to burglary of a laptop and two digital cameras from a nursery school in Crawley. Emma Lee, 38, of Hambleton Hill, Crawley, was fined £100, with a £20 victim surcharge, and £85 costs. She had pleaded guilty to theft from Debenhams in Crawley. Paige Penfold, 19, of Bluebell Close, Crawley, was given a one year conditional discharge, with a £50 fine, a £20 victim surcharge, and £85 costs. She had pleaded guilty to being drunk and disorderly, and to assaulting a police officer. Ana Pita, 31, of Hambleton Hill, Crawley, was given a six month conditional discharge, with a £15 victim surcharge, and £85 costs. She had pleaded guilty to making a false statement to obtain benefit. Jack Buckmaster, 22, of Farmle Close, Crawley, was fined £200, with a £20 victim surcharge, £85 costs, and six penalty points added to his licence. He had pleaded guilty to speeding. Dylan Bent, 22, of Wakehams Green Drive, Crawley, was fined £180, with a £20 victim surcharge, and £85 costs. He had pleaded guilty to resisting a police officer, and failing to answer bail. Lewis Holley, 43, of no fixed address, was fined £120, with a £20 victim surcharge, and £85 costs. 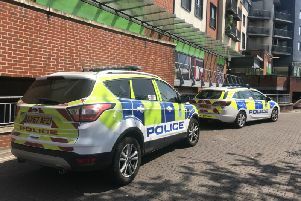 He had pleaded guilty to causing criminal damage to a hotel in Crawley, and admitted breaching a conditional discharge. Mark Ingham, 49, of Melvin Road, London, was fined £50, with a £20 victim surcharge, and £85 costs. He had pleaded guilty to being drunk and disorderly at Gatwick Airport. Benoit Anamalay, 37, of Robin Close, Crawley, was given a one year conditional discharge, with a £15 victim surcharge, and £85 costs. He had pleaded guilty to theft from Sainsbury’s in Crawley. Lloyd Edwards, 29, of Woodbridge Avenue, Leatherhead, was given an eight week jail sentence, suspended for a year, with an £80 victim surcharge, £85 costs, and £400 compensation. He had pleaded guilty to stealing cash from a charity collection globe and from a travel company, both at Gatwick Airport. James Steele, 27, of Autumn Close, Crawley, was given a 12 week jail sentence, suspended for 18 months, with 200 hours of unpaid work, £780 compensation, an £80 victim surcharge, and £85 costs. He had pleaded guilty to criminal damage, breaching a non-molestation order by making threats, and two counts of assaulting a police officer, all in Haywards Heath. A restraining order was made, barring him from contacting the victim, or going to an address in Haywards Heath. Amjad Anwar, 48, of Plover Close, Langley Green, was fined £100, with a £20 victim surcharge, £85 costs, and three penalty points added to his licence. He had pleaded guilty to speeding. Rokib Abdul, 35, of Kilnmead, Crawley, was fined £220, with a £22 victim surcharge, £85 costs, and three penalty points added to his licence. He had been convicted in his absence of speeding at Bolney. Steven Etheridge, 45, of Deerswood Road, Crawley, was fined £140, with a £20 victim surcharge, £85 costs, and three penalty points added to his licence. He had pleaded guilty to speeding at Crawley. Sachiyo Ishii, 48, of Court Crescent, East Grinstead, was fined £40, with a £20 victim surcharge, £85 costs, and three penalty points added to her licence. She had pleaded guilty to speeding at Crawley. Diane Nicholls, 52, of Moyne Close, Hove, was fined £80, with a £20 victim surcharge, £85 costs, and four penalty points added to her licence. She had pleaded guilty to speeding at Crawley. Mark Roberts, 50, of The Avenue, Eccleston, was fined £660, with a £66 victim surcharge, £85 costs, and six penalty points added to his licence. He had been convicted in his absence of failing to identify a driver suspected of speeding at Crawley. Charlotte Shaw, 24, of Adamson Court, Crawley, was fined £185, with a £20 victim surcharge, £85 costs, and four penalty points added to her licence. She had pleaded guilty to speeding at Crawley. Jordan Berry, 31, of no fixed address, was given a one year conditional discharge, with a £15 victim surcharge. He had pleaded guilty to being drunk and disorderly in Crawley. Ryan Harding, 22, of Worth Road, Crawley, was fined £50, with a £20 victim surcharge, and £85 costs. He had pleaded guilty to resisting a police officer, and failing to give his name and details to a police officer. Lee Wise, 36, of no fixed address, was fined £80, with a £20 victim surcharge, and £85 costs. He had pleaded guilty to causing criminal damage to the front door of a pub in Crawley. Aliyah Levien, 19, of Lawn Terrace, London, was given a community order with a £10 fine, a £60 victim surcharge, and £85 costs. She had pleaded guilty to possessing cannabis at Gatwick. John Kerins, 51, of Newmarket Road, Crawley, was given a community order with 100 hours of unpaid work, a £60 victim surcharge, and £625 costs. He had pleaded guilty to two counts of assault, and causing criminal damage to a door. A restraining order was made, barring him from contacting one of the victims, or going to an address in Crawley. Phillippa Botting, 26, of Station Road, Gomshall, was given a one year conditional discharge, with a £15 victim surcharge. She had pleaded guilty to using threatening, abusive or insulting words or behaviour to cause harassment, alarm or distress in Crawley. Chirag Limbachia, 35, of Salvington Road, Crawley, was given an 18 month conditional discharge, with a £15 victim surcharge, and £85 costs. He had pleaded guilty to using racially aggravated threatening or abusive words or behaviour. Anthony Foukx, 21, of South Lambeth Road, London, was fined £100, with a £20 victim surcharge, and £85 costs. He had pleaded guilty to possessing a Class B drug (cannabis) in Crawley. Abishai Indramoorthy, 19, of Meadowlands, Crawley, was banned from driving for 22 months, with a £220 fine, a £20 victim surcharge, and £85 costs. He had pleaded guilty to drink driving, driving without insurance, and driving without a licence. Bijan Attarian, 36, of Lacey Drive, Edgware, was given an eight week jail sentence, with an £80 victim surcharge, and six penalty points added to his licence. He had pleaded guilty to driving while disqualified at Gatwick Airport. Stuart McKenzie, 38, of Curteys Walk, Crawley, was banned from driving for 14 months, with a £390 fine, a £39 victim surcharge, and £200 costs. He had pleaded guilty to drink driving.